Hi, everyone! Thanks for stopping into Flawed yet Functional today! I’m a huge advocate for owning your health, eating real food, and living a fulfilled life. If you’re curious about my health conditions, read more here, or tasty, healthy recipes click here, or my recent habits for setting up a productive day, click here. Today let’s talk tasty desserts! I’d like to share my Paleo Fresh Blueberry Pie. It is blueberry season in West Michigan, and this cold pie is a staple in our home in the summer. West Michigan has a great climate and soil for fruit growing. We (Michiganders) like to do things ourselves around here so there are u-pick fields aplenty by us. So far this summer, I’ve picked strawberries, blueberries, and raspberries. Before winter hits, I’ll have picked apples and maybe cherries…maybe peaches, we’ll see what the summer holds! My husband grew up loving fresh, cold blueberry pie. 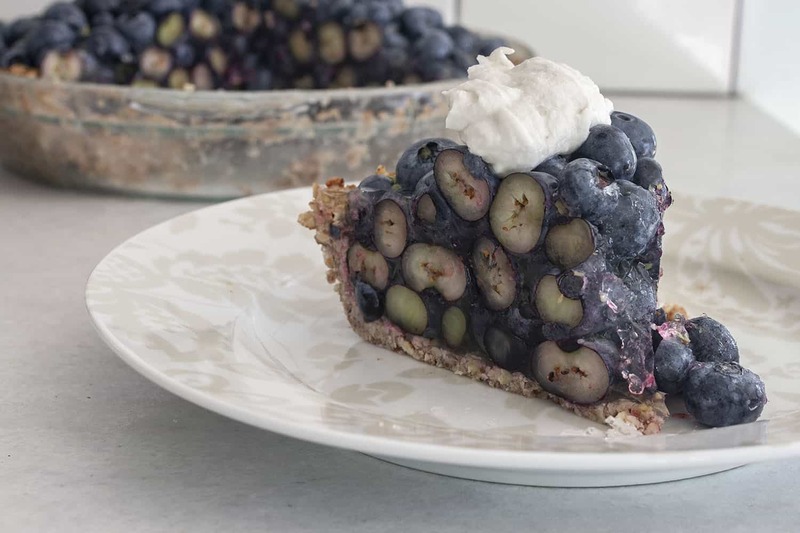 Traditionally, it is made with a graham cracker crust, and the blueberries are held together with lemon jello. 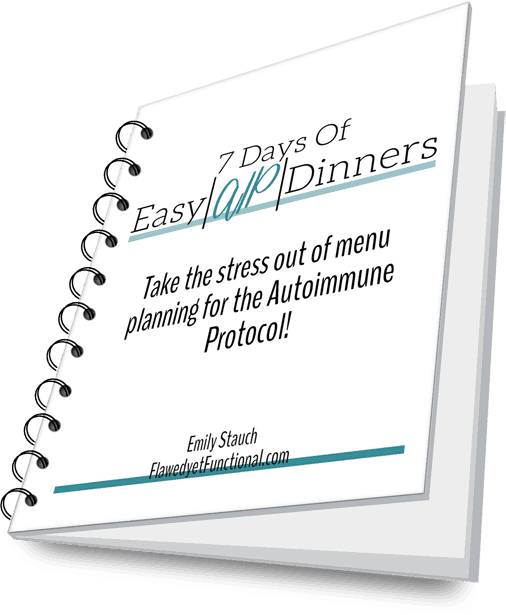 Well, since we can’t eat gluten anymore and as a Type 1 Diabetic, I want to watch my carbohydrate intake, I wanted to give this family favorite recipe a Paleo and low(er) carb make-over. My goals for this pie were Paleo-friendly, cut as many carbs as possible (for a dessert that is! ), and the fewest, whole ingredients possible. The crust is made of crushed pecans (graham cracker substitute) with coconut oil, and a bit of coconut flour to hold it together. It comes together very much like a traditional graham cracker crust, just different ingredients! The gelatin took a quite a few tries to get right. Injecting fresh lemon flavor while still allowing the gelatin to set was trickier than I thought it would be. Come to find out, too much acid messes with the gelatin’s ability to set properly. Who knew?! The ratios in this recipe will set, but you do need to be patient. I recommend making this pie the day before you need it to make sure it is gelled completely. To sweeten the gelatin, I used powered Stevia to keep the carbohydrate count in the pie as low as possible. If you don’t want to use artificial sweeteners, just add your sweetener of choice. However, it matters to the gelling process when you add it. If it’s a powdered/granulated sweetener, stir it into the gelatin before blooming it in the cold water. If a liquid sweetener (honey, agave, liquid stevia), add it with the boiling water. This recipe can handle up to 8 cups of fruit. One of my attempts used 8 cups which made for a nicely domed pie (pictured below). I decided to knock off a cup of blueberries for the final version to cut some of the carbs. A 7 cup pie is a touch less rounded, see below, but still pretty. If watching carbs isn’t necessary for you, use 8 cups! Diabetic Tip: Each 1/8th serving of the 7-cup pie has 25 carbs. For me, that’s too much for one sitting so I usually eat a 1/16th slice. Once the pie has had plenty of time to set, it will cut into nice pieces. Top with coconut whipped cream if that strikes your fancy and enjoy! I hope you enjoy this dairy-free, gluten-free, Paleo fresh blueberry pie! It’s a favorite at our house in the summer and sure to be one in yours too! What are your go-to summer desserts? Do you bake pies for dessert often? I hear there are people out there who don’t like pie. I, personally, don’t understand such people. Are you one of them? 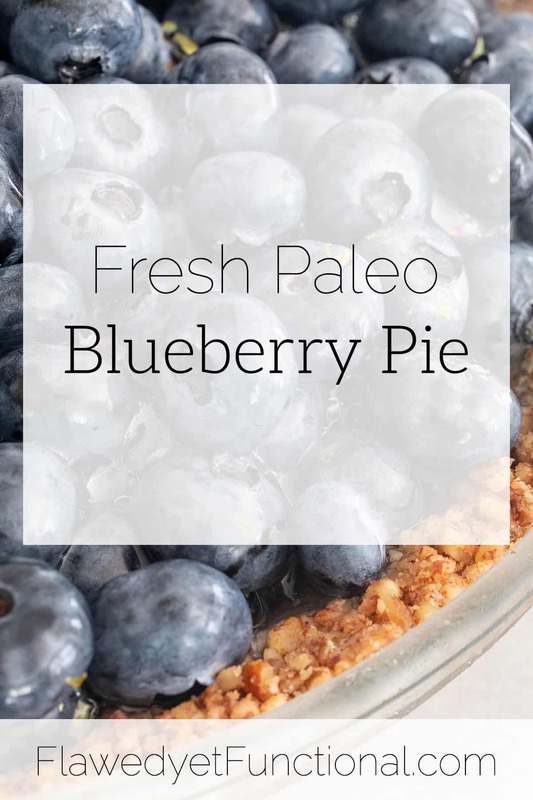 Paleo fresh blueberry pie is light and refreshing, perfect for a summer party! Use freshly picked berries and top with coconut whipped cream for the best summer dessert! 2 pkts stevia, ~1 tsp. In a medium mixing bowl, add crushed pecans, coconut oil, coconut flour, sea salt, and vanilla. Mix thoroughly. Press into an un-greased pie plate firmly on the bottom and up the sides of the plate. Bake for 10-12 minutes until pecans are fragrant. Set aside to cool completely before filling. In a glass measuring cup, add the juice from the 2 lemons (~1/2 cup). Then fill up with cold water to make 2 cups total. Pour the lemon juice and water into a small mixing bowl. In another small bowl, mix unflavored gelatin and Stevia. Gently shake the Stevia/gelatin mixture over the lemon juice/cold water and allow to bloom for several minutes. Bring 1.5 cups of water to boil then stir into bloomed gelatin. Stir in the lemon zest from the 2 lemons at this time too. Put the mixing bowl in the refrigerator to partially set before completing the pie. Check every 45 minutes or so. Around the 2 hour mark, it should be slightly thick and beginning to stick to the sides of the bowl. 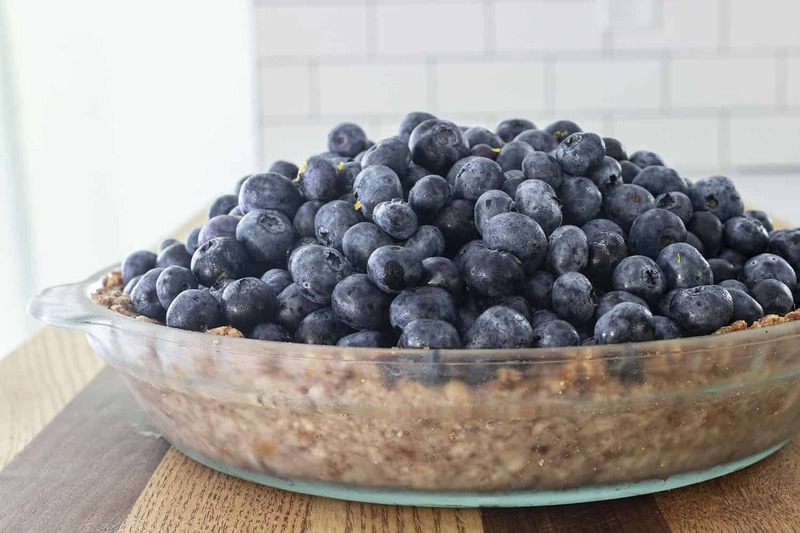 Place the blueberries in a large mixing bowl and gently stir in the gelatin to coat. 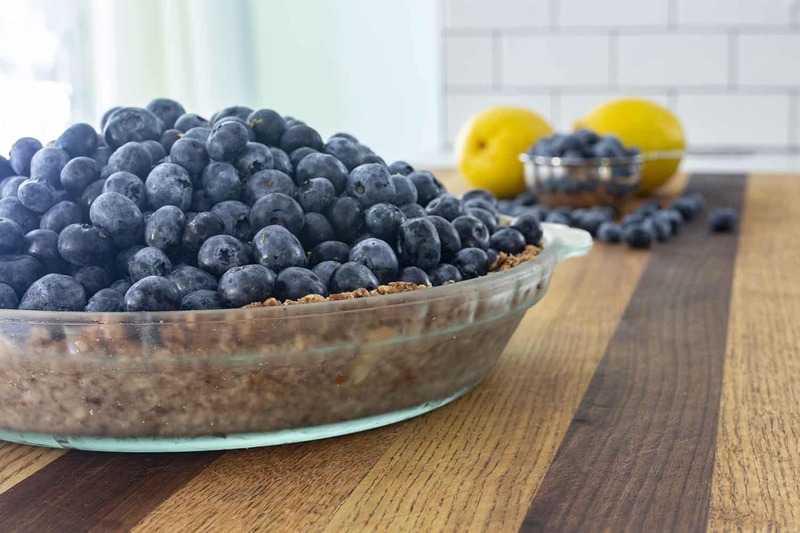 Using a slotted spoon, gently scoop blueberries into the pecan pie crust. Gently move the blueberries around as you add to make them at tight together as possible. 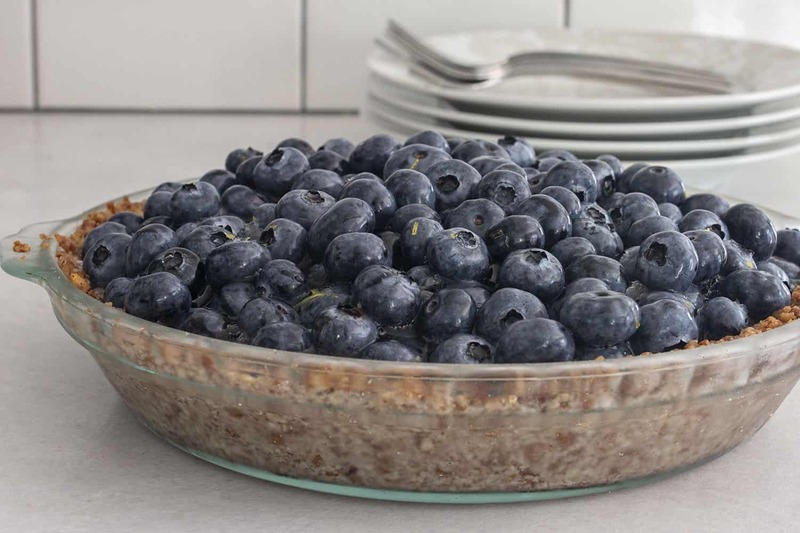 When all the blueberries are arranged in the pie pan, spoon the remaining gelatin over the blueberries to fill any gaps. Fill as many holes as possible without allowing the gelatin to ooze over the sides of the pie pan. You will have gelatin left over. Chill in the refrigerator for at least 8 hours, overnight for best results. Serve cold with coconut whipped cream. Enjoy! This recipe has 25 carbs per serving.